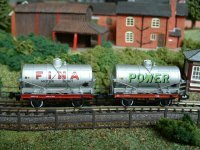 One each of these two colourful and authentic tank wagons from the Graham Farish range. Power Petroleum, based on the Isle of Grain in Kent, were one of many small-to-medium-sized dealers & distributors in the pre-war UK petrol market, and like most of their ilk they didn't last long as an independent company before they were swallowed up by one of the big boys. In the mid-1930s they were taken over by the giant National Benzole Co, but despite this change in ownership the Power brand lived on, with Power Ethyl being one of the first leaded petrols available in the UK. 20 years later they were still going strong, although by now National Benzole themselves had become part of BP. In the late 1950s the new owners sadly pulled the plug on poor old Power, and eventually National Benzole too would take the same one-way trip into history. 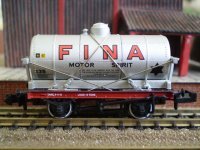 Fina Motor Spirit, meanwhile, was a brand-name used on the forecourts of the UK by the giant Petrofina oil company of Belgium. 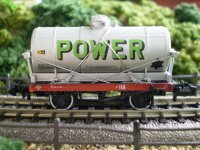 Their rail tankers would have been a familiar sight across the BR network, carrying petrol from refinery to depot ready for onward delivery to their garage network by road. 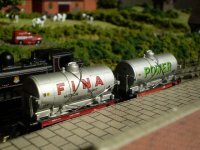 But in the oil industry's endless round of mergers & takeovers, Fina eventually became part of the French conglomerate Total, and the Fina brand evaporated away into the ether. Bring back these two evocative names from the carefree world of 50s motoring with our tank set. Please note that these wagons are boxed individually.